You know the story: a hare and a tortoise race. The cocky hare feels the tortoise is an easy challenge, so he runs some of the race, then decides to play in a field, gets bored with that, and so he takes a nap. Of course, while the hare is distracted in these activities, the slow plodding turtle passes him, and crosses the finish line. Slow and steady wins the race. When considering Scripture passages, it may not be the story that comes to mind immediately. 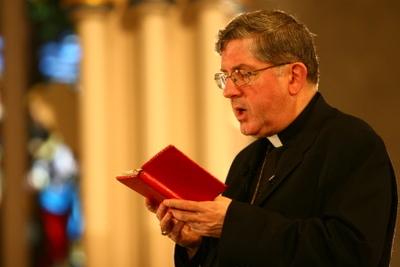 But, it fits for January's edition of Lectio Divina with Archbishop Thomas Collins. In fact, the Archbishop refers to the fable when meditating on the message to the people of Philadelphia -- not the U.S. city, as Archbishop Collins notes, but the church from the book of Revelation. Patient endurance. That is the message to Philadelphia... and to us today. Faithfulness. That is the key. The messages to Philadelphia and Laodicea, found in Revelation 3:7-22, conclude Archbishop Collins' reflections on the book of Revelation, which began in September. Season four will continue from February to June 2011 with a meditation on the entire Letter of St. James. Join us for the broadcast edition of Lectio Divina with Archbishop Thomas Collins: Reflections on the Book of Revelation Sunday, January 16th, at 8:30pm ET, or catch the encore presentation Wednesday, January 19th, at 8:00pm ET.